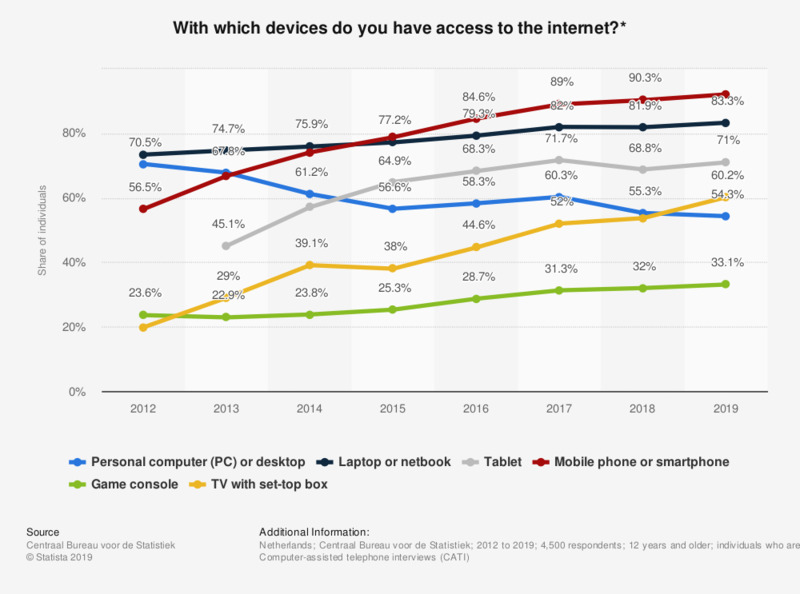 This statistic illustrates the replies to the survey question: "With which devices do you have access to the internet?". The figure demonstrates the share of people keeping different devices with access to the internet in the Netherlands from 2012 to 2018. As of 2018, 82 percent of the individuals from the Netherlands said they have access to the internet with a laptop or a netbook. * Original survey question: "With which of the following devices do you have access to the internet? Irrespective of whether the internet is being used or not. Multiple answers are possible." Everything On "Internet usage in the Benelux" in One Document: Edited and Divided into Handy Chapters. Including Detailed References.